To say that Adam Savage-Hill is just a fan of Alien would be a little like saying that Alien is just a horror movie. It generated more questions than answers, though. Unlike Star Trek fandom and its obsession with starship blueprints and deck plans, the views and vitals of the vehicles of Alien (alien or human) remained cloaked in mystery, especially the Nostromo. A mystery, that is, until I discovered Adam and the products of his intensive research into the Nostromo set plans used (and re-dressed) to portray that well-worn lady of the spaceways. Adam’s sketches are a primer in the creativity of movie magicians who, on limited budgets, manage to portray science fictional settings from mundane items like lumber, construction materials, and scrap metal: in this case, a futuristic tugboat flying between the stars. Not only does Adam draw these out, he builds scale models of them, including most of the main areas seen on film. Our first conversation had to do with the idea of using the set plans as a guide for plotting out deck layouts for the ‘real’ ship. I hoped to expand on some basic plans I’d drawn years ago. 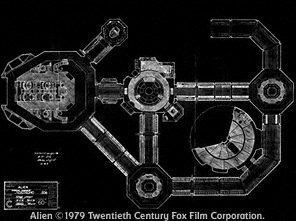 There are many legends about the Nostromo set and exactly how much of the ship as seen on-screen was actually built. Adam had a lot to say about it, all backed up with careful research. With playful wit, he explained how it was not possible, given the nature of the sets and their limitations. THE NOSTROMO FILES BLOG (TNFB): Welcome, Adam! Let’s get right down to business: your knowledge of Alien’s production history is impressive and seems beyond the average reach of most fans. How did it all start for you? ADAM SAVAGE-HILL: It was a very long time ago back in 1978 (I think October), when I was given some notes, blow-up photos, and a media pack of Alien’ from a relative who worked at Shepperton Studios. TNFB: That must have been exciting, right? SAVAGE-HILL: Initially, I wasn’t really that interested since: 1) it was an X-rated movie [in the UK] and, 2) I was still mad keen on Star Wars! The TV adverts back then were quite strange. It was when I was watching a bootleg VHS copy of Alien in 1980 (about May/June) and I thought it was absolutely brilliant: I watched it twice again, and ran upstairs to grab my given collection and matched the whole deal up and realised that this was a seriously great movie. It didn’t really make sense to how I thought it looked like in the movie; I drew this monster relentlessly–even driving my parents mad with my endless drawings! TNFB: Ironic that your collection actually began before your fervor for the film did. Collectibles are much easier to get now, through official sites or the auction sites. As your interest grew, how did you expand your collection? SAVAGE-HILL: In the days before the interweb, I had to be smart and very sharp to get anything related to Alien. First, I met up with my relative and she handed me some more stuff that she had. With these items, I got to understand how the sets were laid out in a vaguely octagonal-shaped layout. I remember her telling me that the production was really tight and very few people–even if they wanted to–walked around the sets at night or early morning because it was so creepy, which simply added to my perceptions and imagination of this wonderful horror movie! TNFB: Right. I remember seeing set shots of empty corridors. Even though Star Wars had shown us a “lived-in future”, the Nostromo sets looked so ominous and spooky. Such a unique vision of science fiction that hadn’t been seen before. SAVAGE-HILL: I was reliably informed that the BBC props department were sniffing around the back-lots of Shepperton, taking pieces of the corridor sets and mess room components, until Ridley caught sight of this pilfering and burnt quite a lot of the stage sets and virtually all the props in a huge bonfire. Everything else was crated up and sent off to L.A. This pilfering was a common thing back then as TV companies’ budgets were very often quite tight. The evidence came to light in an episode of Doctor Who and much more seen elements of the C Level corridor set in Hitchhiker’s Guide To The Galaxy‘ series, which was amazing! TNFB: Alien set a new standard and is still a touchstone for realistic sci-fi cinema. SAVAGE-HILL: That aside, I saw for sale a few Alien related items in July 1980 which I still have: Alien: The Movie Novel, Alien: The Illustrated Story (signed by the heavy metal artists themselves), a calendar from Heavy Metal, Giger’s Alien, and two poster magazines of Alien. Later, I received a copy of Ron Cobb’s Colorvision. I still have all of them in my archives and from then on, I have constantly added over the years. TNFB: When did you start looking for details in the video material? SAVAGE-HILL: It was later, as I watched Alien on laserdisc (this was before Nicam and HD, remember), that wearing my detective’s hat I started to make physical sense of Alien — and in particular the Nostromo. I had basic knowledge that on-stage sets don’t always match models (and vice-versa!). Little by little, the element of disappointment of reality gradually melted off the stupid idea that, according to my friends, the studio sets were really made three storeys high. I realised it was the result of typical footage-editing and stage re-designing — standard cinematic trickery and illusion! Watching the movie (from 1980 onward!! 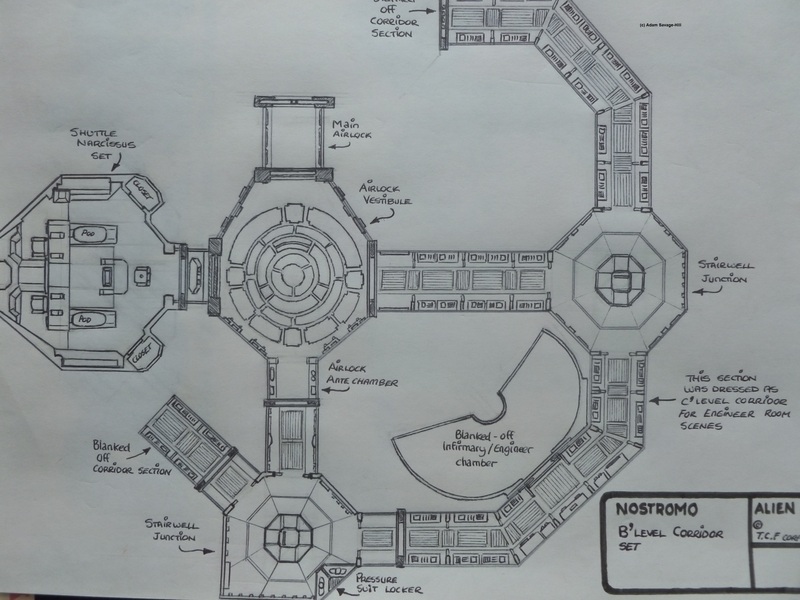 ), constantly drawing out the corridor layout, and working with what I was watching, I had pretty much worked out the whole layout of the Nostromo set by 1983. So I made a couple of small model sections, of which I still have! TNFB: When I discovered your models, it was the proportions that caught my eye, especially when your camera angles replicated shots from the movie. How did you get that so accurate? SAVAGE-HILL: Part of the model-building was sheer curiosity really–since I could not actually be there, I wanted to “Be There”, albeit on a much smaller scale. Also, I knew most of the sets were fully enclosed I wanted to also see what was unseen to the left, right and behind the camera, and to also take photos of familiar views but from a different angle for others to appreciate more these wonderful Nostromo sets. Basically, over the years I have used Alien as a testing board for my creative skills in painting, drawing and photography. It’s one of the reasons why this movie really means a great deal to me personally–as well as it being a classic British-made horror movie filmed here in London–the home of Alien!! I had always seen the idea of building a scale model of the whole Nostromo interior as a very attractive challenge and actually measured out the floor-size dimensions of such a model. TNFB: I’m sure at some point we’ve all had the dream of walking those corridors, so it appears you are plugged into a collective thing here. So how did it go? SAVAGE-HILL: I quickly realised that, even in my own house, it wasn’t a viable option: it would have covered approximately 100 feet by 100 feet!! So, I decided to draw out a schematic layout of each room and corridor section to the scale of 1/16 and build them in a style that each can be interlocked together and packed away separately, as a diorama would be so made. TNFB: How have the releases of new material helped? SAVAGE-HILL: My collection of Alien VHS tapes, two uncut videos, a laserdisc, the Quadrilogy DVD set — and the recent Blu-ray set — has enabled me to progressively sketch out, in quite some accurate detail, how each room looked. The slowly-released photographs of Bob Penn (a big thanks to Mr. [Charles] Lippincott!!!) were a fantastic godsend to people like myself in search of more information and detail concerning the Nostromo sets. TNFB: With so much information, it would seem easy to become overwhelmed. SAVAGE-HILL: Over the years, I gained a very detailed understanding of the Nostromo interiors and exteriors, as well as the reportage of Alien, both as a film and in culture, too. I am self-taught, you could say! Nothing in the movie escaped my eye — from the background audio soundtrack, the on-board graphics, the video monitor matrix displays, the food the crew eat and so on and so on! I think I probably spent more time “on set” than Ridley Scott in terms of virtual reality!! TNFB: Being an expert on Nostromo sets, you’d be a natural advisor for online discussion groups. Do you ever participate? SAVAGE-HILL: I tend to avoid online forums as much as I can, as it gets political with the “I know more than you, so there!” attitudes and the inane competition of trying get “one up” on others who simply want inspiration, ideas, understanding and enjoyment of Alien. To me, the point of enjoying Alien is sharing one’s knowledge and enthusiasm in a constructive positive way. There is always that one photograph, footage or information that someone out there will have and will share with us!! TNFB: A good perspective to have and to promote. Thanks for taking time to talk about your Alien story, Adam. SAVAGE-HILL: You are welcome. Any other questions, please, do not hesitate to ask! See more of Adam’s work at his Flickr Photostream and at The Nostromo Unplugged Facebook Page. Glad you enjoyed Adam’s tale. Thanks for stopping in. Um… since you don’t clarify it, this isn’t Adam Savage from the Mythbusters, or is he? I was just wondering bc of that recent set video from Covenant. You are correct that Adam Savage-Hill (or ASH, if you will!) is not the Adam from Mythbusters. Thank you for stopping in and commenting.